If you are a complete beginner, start from here. We have the best Russian courses. Read and listen to texts in Russian with audio, graded by level and with English translations. Read, listen and learn hundreds of useful Russian phrases for all kinds of situations. Learn and practice here: Videos, grammar tables and exercises with hundreds of questions. We have put together all kinds of ideas to help you practice and improve your Russian. 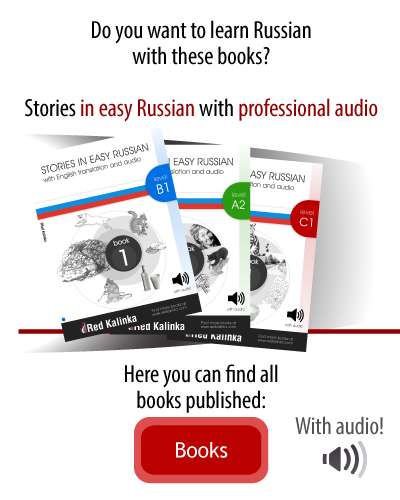 In addition to our free resources, we also sell the best books and courses for Russian learners. Do you want to contact us? Do you want to report an error in our web? Please do it here. Why learning Russian?Because it's the 5th most spoken language in the world by total number of speaker. If we take into account only native speakers (144 million native speakers in Russia, Belarus, Ukraine and other countries), it is the 8th in the world. 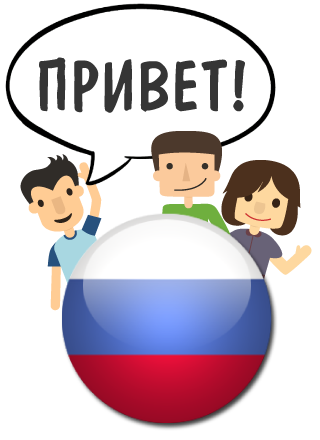 All in all, Russian is more spoken than many other popular languages such as French, German or Japanese. Another reason to learn this language is because major events such as the 2014 Winter Olympics (in Sochi) or the 2018 FIFA World Cup will take place in Russia. Or because the Russian Federation is the 6th largest economy in the world. There are many reasons, you only have to choose one! Learn how to read Russian: Learn how to read the Cyrillic alphabet easily. 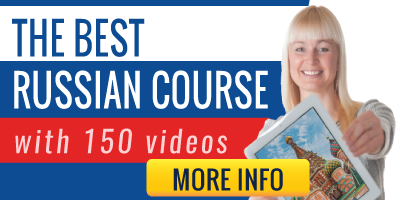 Basic Russian course: Maybe, the best online course on the Internet. The Russian cases: Learn the case system listening to dialogues. Music videos: When you listen to Russian songs you're training your listening comprehension, and you can study while enjoying. We have included with each song the original lyrics plus the English translation. Russian cartoons: Forget for a while about lessons, grammar and exercises. This is a fun way to learn a language. Besides, in each episode you'll find a full transcription of the Russian dialogues and a table with useful vocabulary. Comic strips from Garfield: The most famous cat speaks Russian. Comic strips from Dilbert: Funny situations working in the office. Russian forum: You don't have to be in Moscow or Saint Petersburg to have Russian friends! If you have any question regarding the language, culture and history of Russia or about the Soviet Union or about travelling to Ukraine,... this is your forum. Russian alphabet: Listen here to each letter of the Cyrillic alphabet. Also, we help you with examples: for each letter we show you 5 examples of Russian words, so you get used to its sound. As always, the audio has been recorded by native speakers. Podcasts in Russian: Improve your Russian by listening to these podcasts. They are short articles on all kinds of topics, that include audio in Russian and vocabulary notes. Where is Russian spoken? All around the world. It's a Slavic language spoken in Russia, Belarus, Ukraine, Kazakhstan, Kyrgyzstan and other ex-republics of the USSR. Also it's one of the only 6 official languages of the United Nations, and countries such as the United States or Germany are home to millions of Russian speakers. Why do you want to learn russian? Are you travelling to Russia or Ukraine? Do you love learning languages? Whatever the reason, learn Russian with us. We have developed this website to help you learn this wonderful and powerful language. If you like our website, please share it. Copyright © 2010-2018 www.russianforfree.com All rights reserved.